Bluetooth speakers may be increasingly popular, but those looking for the very best sound quality shouldn’t discount mini hi-fis – and they’re not as expensive as you might think. This month we’ve tested some of the leading mini hi-fis on the market, including the new Denon DT-1 and Denon CEOL N10 to find out which sound the best in our expert lab tests. For decades hi-fi systems – also known as micro hi-fis – have been the gold standard for sound quality, and for good reason. While wireless and Bluetooth speakers can often compromise sound quality for a compact and stylish look, the powerful drivers and optimal designs of the best mini hi-fis still make them one of the best options to make the most of your listening. 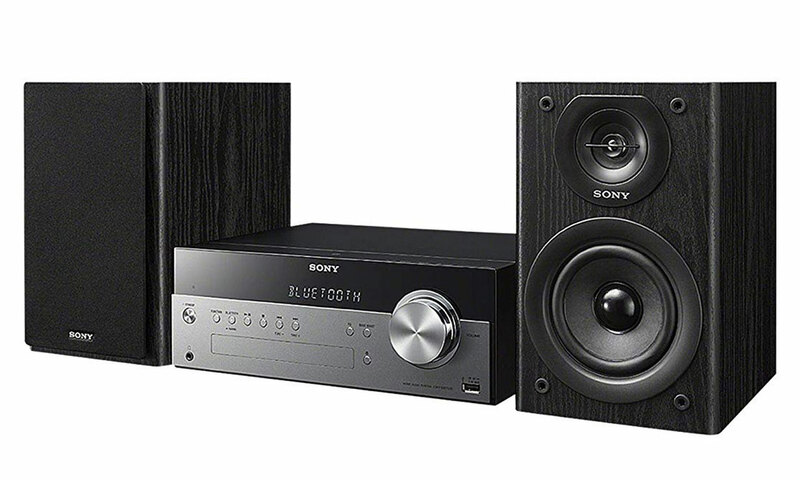 Whether you’re looking for an all-in-one mini hi-fi, a mini hi-fi with separate speakers, or a receiver unit to connect to your own speakers, we’ve found Best Buys of all types that will deliver outstanding sound quality. Find our which models are worth buying through the links below. Best mini hi-fis – find out which mini hi-fis are worth your money. The all-in-one John Lewis Cello with its wooden cabinet finish looks like the ideal, versatile mini hi-fi. The built-in speakers cut down on messy wires, and it supports a powerful range of features, including a CD player, DAB+/FM/internet radio and Bluetooth to play music off your smartphone. You can even play music stored on a USB stick via the USB socket or on your home network over wi-fi, connect the Cello to other devices such as a record player or turntable using the aux in socket, and there’s also a headphones socket for private listening. But does the sound quality make this package worthwhile? Our discerning listening panel of music industry professionals put it to the test in our expert John Lewis Cello review. The Cambridge Audio One is what’s known as a receiver – the main unit that contains all the functions that you then connect to separate speakers. 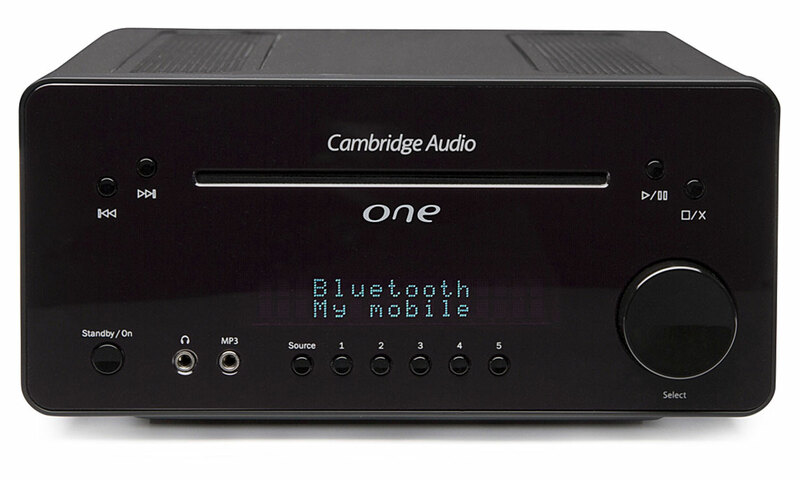 The Cambridge Audio One features a CD player, Bluetooth, DAB/FM radio and a powerful range of sockets that allow you to connect it to your TV, set-top box, games console or Blu-ray player. We connected the One up to the speakers Cambridge Audio recommend, the Cambridge Audio Minx XL speakers (these are sold separately for around £219). Is the Cambridge Audio One worth the cost, or are there cheaper options that beat it? Find out in our definitive Cambridge Audio One review. 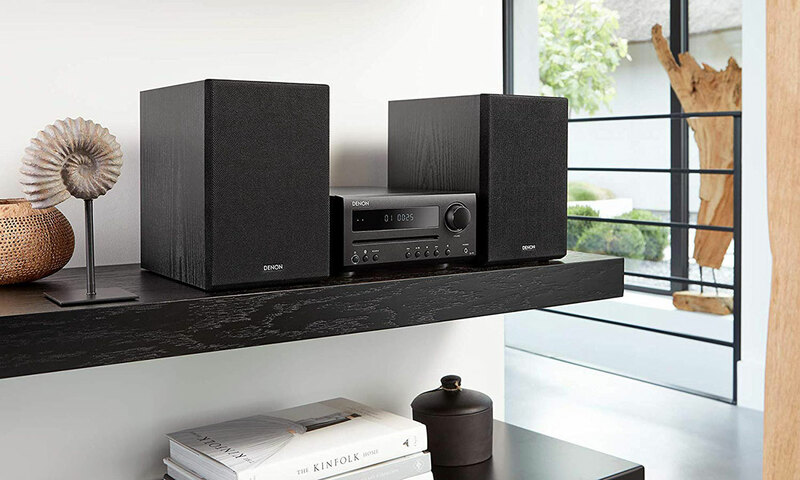 Coming from one of the most well-known traditional mini hi-fi brands, the Denon DT-1 is available in a black or grey finish, and comes with a CD player, FM radio and speakers included in the box. As usual for mini hi-fis, there’s a handy remote control for use from a distance, and Bluetooth allows you to stream audio from your smartphone through the mini hi-fi’s speakers. You can save a generous 30 FM and 10 AM radio stations for easy access to your favourites too. Denon says the the Denon DT-1 is ‘engineered with a more than 100-year Denon legacy in audio excellence’ and say you should ‘trust this high-quality and durable system to deliver the ultimate audio experience.’ Bold claims. We compared it side-by-side at our lab with the best on the market to find out whether it delivers. Find out whether this is one of the best-sounding mini hi-fis you can buy in our comprehensive Denon DT-1 review. 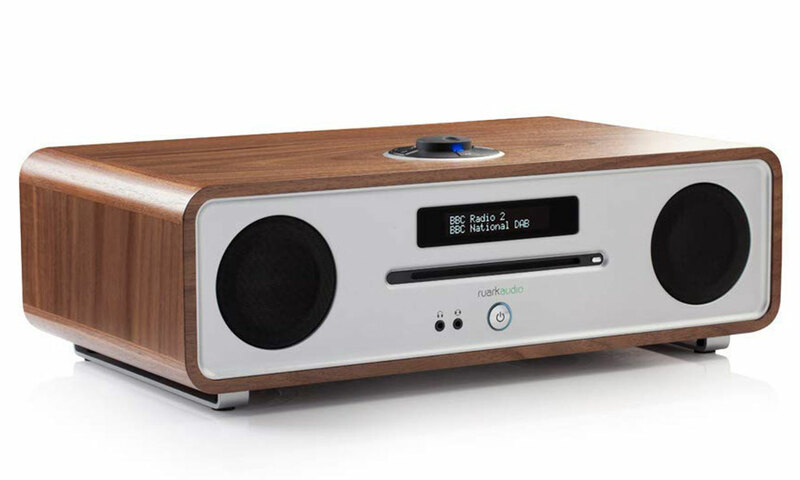 Like Cambridge Audio, British audio specialist Ruark Audio has built a reputation for manufacturing stylish and feature-rich audio products, and the Ruark Audio R4 MK3 is positioned right at the top of the all-in-one mini hi-fis market. It’s targeted at those wanting the very best sound quality possible, but who are also looking for a minimalist design without messy wires connecting to separate speakers. It may be expensive, but there’s no need to buy separate speakers. It even features an OLED screen – technology more often seen with high-end TVs. It’s available in three premium finishes, featuring a CD player, Bluetooth to stream audio from your smartphone and DAB+/FM radio. Wired connections are also available, with aux in and USB sockets for music playback from your devices, and a headphones socket for private listening. There’s even phono, digital optical (TOSLINK) sockets so you can connect a turntable and other devices. So is it worth the hefty price tag? Our discerning listening panel put it through its paces in our extensive Ruark Audio R4 MK3 review. 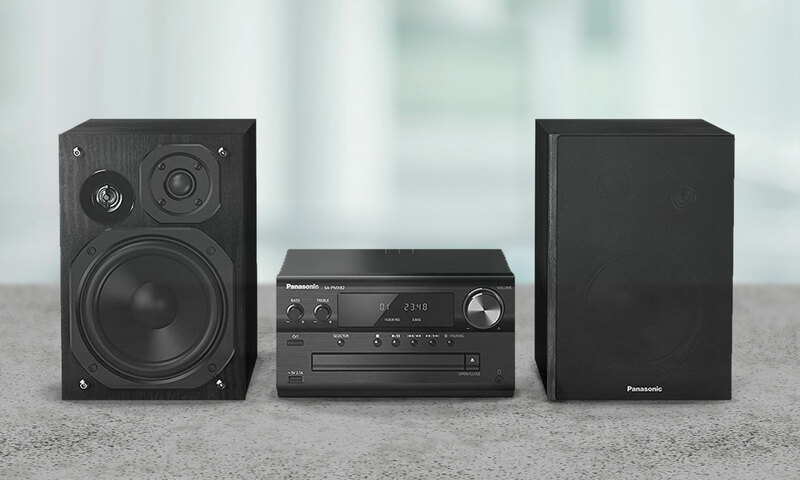 The Panasonic SC-PMX82 is a timeless-design mini hi-fi that looks like it will suit those looking for a very traditional model. It features unassuming separate bookshelf-style speakers in the box, a substantially sized remote control and a good old-fashioned volume knob. What’s more, it comes packing a hefty 120W of power (60W per speaker) – a lot for a mini hi-fi system in this day and age. There’s a CD player, DAB/FM radio and a USB socket (that supports iPhones and iPods) for playing digital music and audio files, plus Bluetooth too for playing audio off your smartphone or tablet. Panasonic has had mixed fortunes in our mini hi-fis testing. Find out whether this is one of their success stories or disappointing failures in our thorough Panasonic SC-PMX82 review. The Denon CEOL N10, available in black or silver, could be the ideal mini hi-fi for those looking for an all-round sound system with the latest modern features. 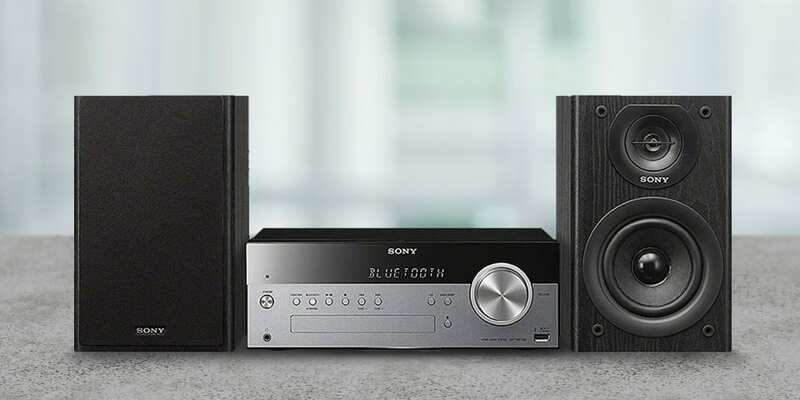 Denon promises ‘enthusiast quality’ sound from the included separate speakers, but you can also buy the receiver main unit on its own (called the RCD-N10) and connect it up to your own speakers. 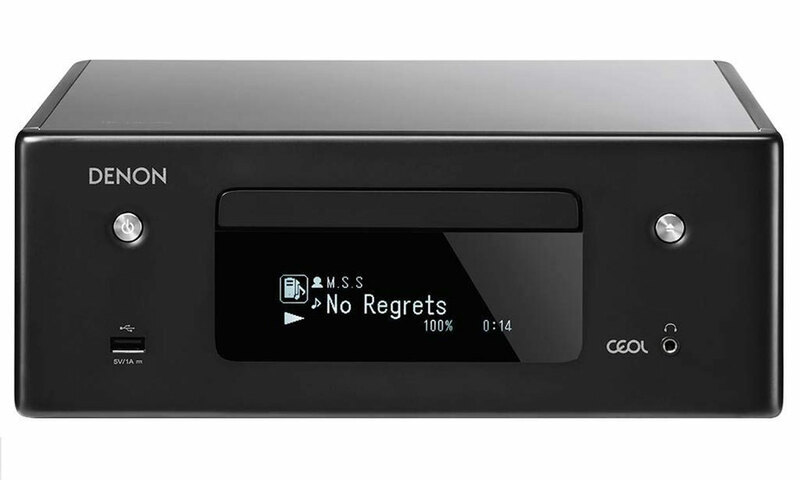 The CEOL N10 comes with all the functions you’d expect – a CD player, FM and internet radio, a remote control and Bluetooth to play audio from your devices such as your phone, tablet or laptop. There’s plenty of wired connection options as well, and wi-fi support allows you to play music off devices connected to your home network. A wide range of music streaming services are supported including Amazon Music and Spotify (may require subscriptions) and radio station streaming via TuneIn radio. The CEOL N10 is even compatible with Alexa and Google Assistant for controlling your mini hi-fi hands-free with only your voice, via separate Alexa and Google Assistant devices such as the Amazon Echo Dot and Google Home Mini. Could this be the perfect all-bells-and-whistles smart mini hi-fi for you? We find out whether the sound quality is worth the price in our full Denon CEOL N10 review. The venerable Sony CMT-SBT100 has been around for a long time, launching way back in 2014, but it’s still one of the top sellers. 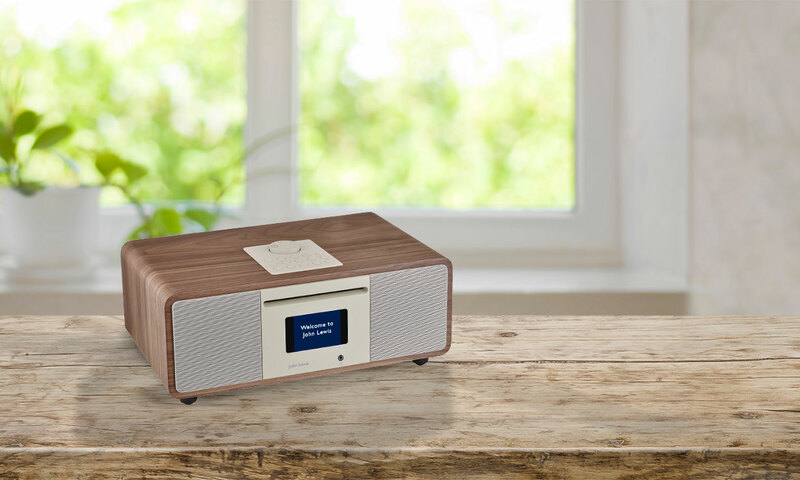 It has all the core mini hi-fi features you’d expect, including a CD player, DAB radio, USB audio playback from separate devices like a hard drive, and Bluetooth to stream audio from your smartphone. Despite its attractive price, it also has two 25-watt separate speakers included in the box. Is this a bargain or is there a catch? Our professional lab give their verdict in our expert Sony CMT-SBT100 review. We’ve tested so many mini hi-fis there’s too many to feature here. 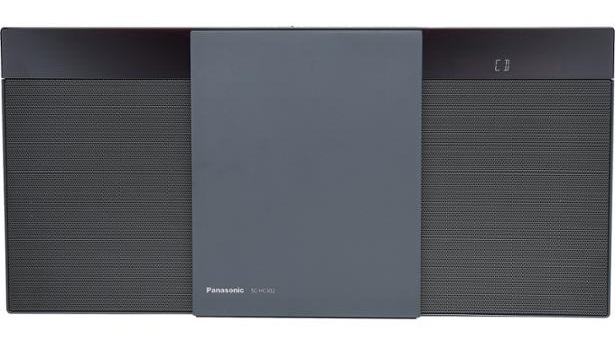 For example, Panasonic make a wide range of wall-mountable panel-style mini hi-fis like the Panasonic SC-HC302, as well as a range of models like the Panasonic SC-RS52EB-K that look more like a bedside alarm clock radio. We’ve tested a whole range of micro hi-fis across the market, and have discovered a small number are vastly better than the rest. 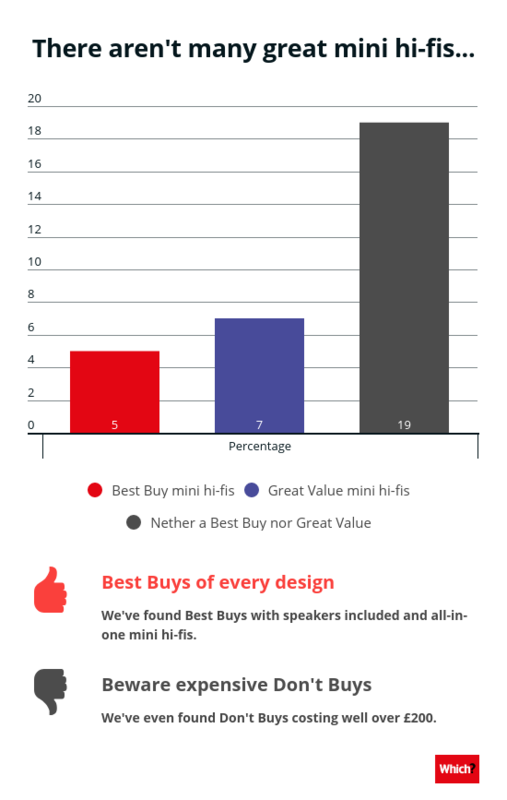 In fact, only five mini hi-fis currently on the market are Best Buys, and another seven we’ve awarded our Great Value status. Our top recommendations include all types of mini hi-fi, from separate speaker models to ones with built-in speakers, and even wall-mountable and ultra-compact options. However, we’ve also found a lot of really disappointing models, including Don’t Buys costing a lot more than £200. Be sure to check out our reviews to make sure you avoid an expensive mistake. Our lab experts test each mini hi-fi not only for sound quality, but also how easy they are to set up and use, and whether all features work as well as you’d expect, so you can be confident you’ll get a mini hi-fi you can count on. For the full list of mini hi-fis we’ve tested, head over to our mini hi-fi reviews.